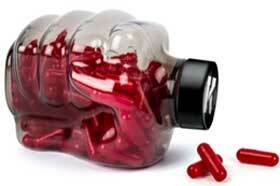 Sitting inside their fist-shaped plastic bottle, Instant Knockout fat burning capsules have a distinctly masculine feel. The predominantly grey box does little to soften the product’s macho look, but Instant Knockout is a fat burner for women as well as men, despite its obvious guy appeal. 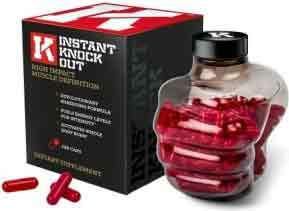 Instant Knockout is manufactured in by Roar Ambition Ltd, and is marketed exclusively via the product website. The price per bottle is 74AU$ with multi buy option bringing the price down to about $56UA$ per bottle. There is worldwide shipping offered along with a 90 day money back guarantee. Instant Knockout is designed to speed up the metabolism and cause the body to burn more calories. The manufacturers also state it supplies appetite suppression. If the formulation lives up the promises made for it use of the capsules should also cause the body to start burning fat to provide extra energy. Vitamin B6 (5mg): A water-soluble vitamin that is known to support the metabolic process and help the body to convert food into energy. Vitamin B2 (10mcg): Helps ensure healthy thyroid action (a sluggish thyroid gland can cause hormonal imbalances that lead to weight gain). Zinc (10mg): A mineral that aids digestion, boosts the immune system, and improves energy metabolism. GTF Chromium (100mcg): Although its reputation as a fat burner cannot be wholly supported by scientific evidence, chromium continues to be a very popular diet pill inclusion. Green Tea Extract (500mg): Green tea catechins have been proved to boost the metabolism and initiate thermogenic fat burning. One study shows the effects of green tea extract can be improved when combined with caffeine. Caffeine Anhydrous (350mg): A powerful stimulant that can boost energy levels and provide appetite suppression. Green Coffee Extract (100mg): The chlorogenic acid provided by green coffee bean extract has an outstanding fat burning reputation and is also believed to help lower high blood pressure. Cayenne Powder (100mg): A chili pepper extract that increases the metabolism and can cause the body to burn calories 12 times faster than normal. Glucomannan (500mg): A natural fibre extracted from the roots of the konjac plant. Glucomannan expands with water and fills the stomach to provide appetite suppression. Black Pepper Extract (10mg): Contains an alkaloid (piperine) that can boost the metabolism and contribute to fat burning. Black pepper extract is also known to help smooth the absorption of other ingredients. Usage Instructions – One capsule should be taken four times a day. Not surprisingly, the choice of packaging has been commented on more than once, with one lady calling it “unsightly” and another “just plain stupid”, but the Instant Knockout capsules themselves appear to be a big hit with the majority of female customers. Side effects are unlikely to be an issue for the majority of users, but pregnant or breastfeeding mothers should check with a doctor before using dietary supplements. Women who have existing health issues or are taking medications should also seek medical advice before commencing supplementation. 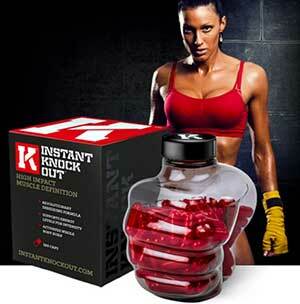 Instant Knockout appears to be an effective women’s weight loss supplement. The blend contains a number of good ingredients that should be able to provide the kind of results the manufacturers promise, and customer feedback suggests the majority of users have experienced such results. The bottle is a cliche, but we are impressed by Instant Knockout and doubly so by the length of the money back guarantee period. Many manufacturers fail to offer any guarantee at all and those that do usually only offer 30 days, so a 90 day guarantee is most impressive. The manufactures obviously have a lot of faith in their product. 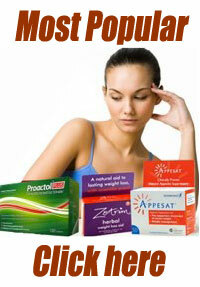 We do as well and are happy to add Instant Knockout to our list of approved weight loss products.